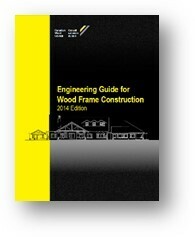 The CWC publication Engineering Guide for Wood Frame Construction 2014 Edition is now available. This fourth edition is produced to provide guidance to engineers, building designers, building officials, builders, and students on the structural design of wood elements and connections for wood frame buildings that meet the requirements of Part 9 of the National Building Code of Canada. The Engineering Guide aids designers in bridging the gap between an engineered design following Part 4 of the NBC and a prescriptive design following Part 9 of the NBC. Coming soon – package deal with online version and print copy.